This is an approximation of what my daughter board for NoviceGuard, with WS2812 SmartLEDs looked like. The colors... especially the bright "LED" blue at the lower left... are MUCH prettier in the real world. See it in action in a 40 second YouTube clip of the NoviceGuard/ DS2812/ SmartLEDs demonstrator... which doesn't do the vivid colors justice! The daughter board lets you plug WS2812 SmartLEDs into an Arduino. SmartLEDs are really cool, worth the very small nuisances involved in getting started...a power supply, a capacitor, a resistor, and some SmartLEDs, and you are Good To Go. 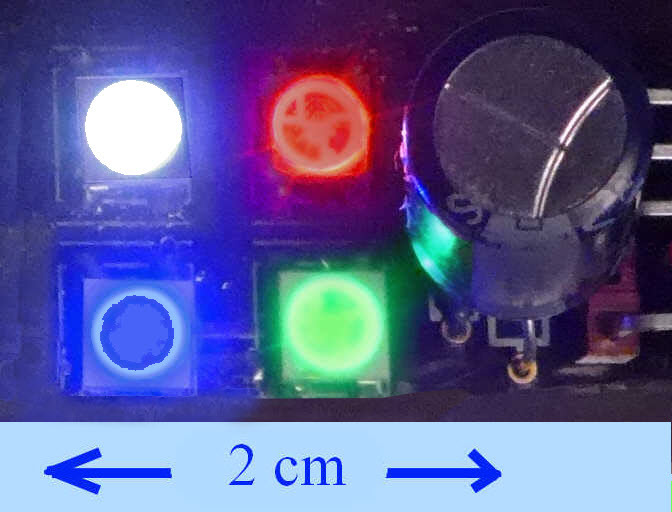 A SmartLED is a small (5mm on a side) module with a red, a green and a blue LED... very BRIGHT! LED... and some control circuits. With just one output line from something like an Arduino, you can set each of those LEDs to any brightness from 0-255. From more than 10cm away, the three LEDs blend into a single point of color... any one of 16 million colors. Red and yellow and green and brown and scarlet and black and ochre and peach and ruby and olive and violet and fawn And lilac and gold and chocolate and mauve and cream and crimson and silver and rose.... if Tim Rice will forgive me using his line. This is a daughther board for the NG_PwrDemand_2 power scenario. You need some SmartLEDs. I'd buy these connected up for you, if I were you. The small board you'll see in the video is for "proof of concept. It works. But is fiddly to assemble. But if you REALLY want to go that route, get in touch. (Eddress at bottom of page.) You'll find details of a nice SmartLED array to begin with, and some more technical details, at a page I did about SmartLEDs in general. The page you are reading here is about marrying SmartLEDs to an Arduino across a NoviceGuard. The other page will also tell you about the essential (no, you can't leave them 'til later) power supply, capacitor and resistor. 5v from an external supply, not through the Arduino, (NoviceGuard J1 using "Ex"). You don't have to use a NoviceGuard to benefit from this page. The NoviceGuard just makes it easier for novices to hook things up. (We will be using four inputs... you don't "need" any, but with inputs, you can select different patterns for display on the SmartLEDs.) The inputs we need are on the NoviceGuard. I've done a separate page on doing NoviceGuard challenges/ programs without a NoviceGuard. (You just have to provide.. not hard... your users with the things NoviceGuard would give them. For this exercise, four buttons (or fewer, if you don't mind losing functionality) to press that the Arduino can "see" being pressed. ... if you want to plug the daughter board (or equivalent) into the daughter board socket I was using, the one connected to digital pin 5 of the Arduino. boInHigh(x), where X can be 0,1,2 or 3: Returns "true" or "false", depending on whether a button is pressed. It reads one of four buttons, which one depending on the value you have in x.
makeOuUL(x), where X can be 0 or 1: Makes the Upper Left output high or low, depending on the value you have in x... and some similar routines for UR and LL. You WILL need the Adafruit_NeoPixel library to use the software below. Obtaining and installing that, if you need help (it isn't hard) is contained within the page I already cited about using WS2812 SmartLEDs. The following shows you all "the stuff" you need to get the thing working. Well. Showing a static display of four SmartLEDs, one set to white, one to red, one to blue and one to green. That's it. Everything you need to generate the display shown in the photo at the top of the page. There are various "setup" bits. Then the four SmartLEDStrip.setPixelColor... lines, one for each SmartLED. The setPixelColor() commands updates an entry in a buffer in the Arduino's memory; the SmartLEDStrip.show() command sends... exceedingly quickly... a "long" message to the array of smart LEDs. A message boiling down to "LED0, you should be..., LED1, you should be...., etc" (One "you should be" for each smart LED)". (The buffer is set up for you by the SmartLEDStrip.begin()). The following doesn't do anything "clever" with turning the SmartLEDs on and off, or setting their color or brightness. The whole program is "just" some SmartLEDStrip.setPixelColor... lines, with amartLEDStrip.show(); thrown in from time to time. The "cleverness" (such that it is) in this is in the control structures allowing a user to "tell" the Arduino which of several available dynamic patterns should be presented. create the NovGrdCore object (NGC). //It will appear on serial monitor. //  SmartLED array on it. That's it. I hope it fanned your interest in NoviceGuard, or the SmartLEDs, or both!